I always loved getting stuffed pastas when I was little when we would go out to eat. It seemed so exotic! How did they get the stuffing inside the pasta? Now not that I've mastered the art if pasta making, I'm still in awe of people who can make tortellini, but in my house we like to make our own ravioli and stuffed shells! 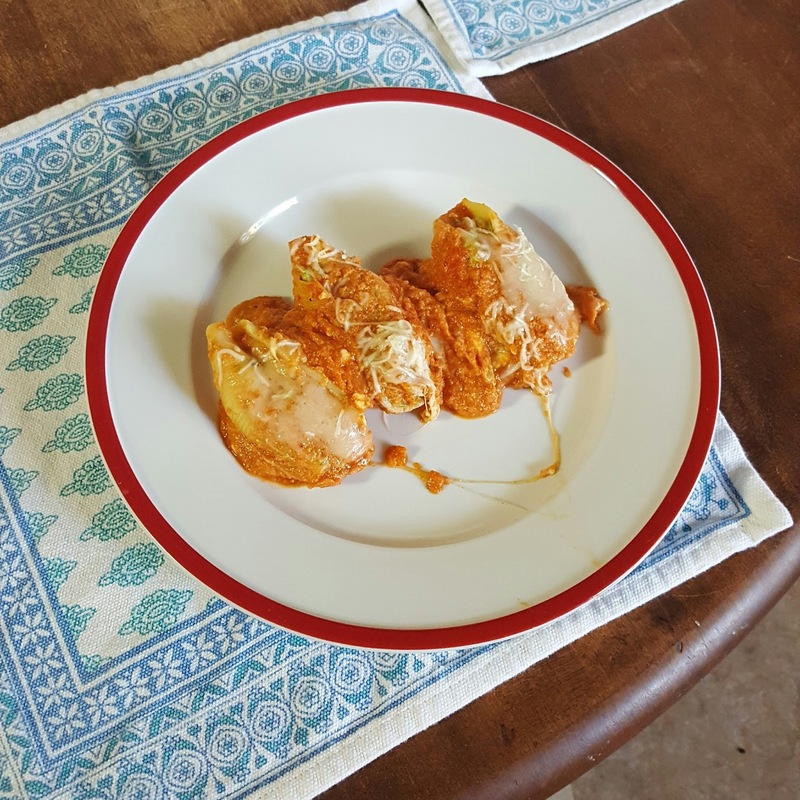 Today's recipe is for stuffed jumbo shells. In boiling water, cook the jumbo shells until slightly al dente. Set aside. Combine 1 container of ricotta with the tomato sauce. Set aside. Using a food processor, combine the remaining​ container of ricotta with the spinach. I don't measure it, but I go off of color. A light, pale green us a good mix. You'll know it when you see it. Mix in some salt and pepper. Stir in the chicken if you are adding that to the mix. Using a piping bag or 2 spoons, fill each shell with the ricotta mixture. Position each shell face up in the baking dish. Once the baking dish is full, pour the tomatoe sauce and ricotta over the shells. Then cover it up with the mozzarella. Bake at 350 degrees until the cheese is melted and starting to brown, usually about 30 minutes.